Please see the image below for examples of waste that are recyclable through this program. Can I only collect Febreze-branded aerosol containers through this program? 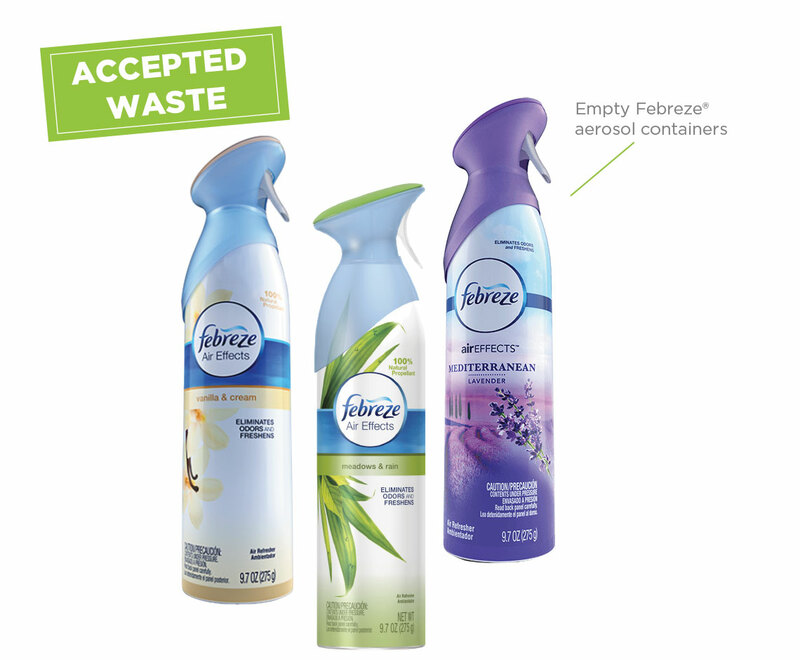 Yes, only Febreze-branded empty aerosol containers are accepted through this program at this time. No, you do not need to clean the waste before sending it in to TerraCycle. Participating is completely free, but all participants must adhere to strict shipping requirements for this particularly program. Aerosols must be in their own box; do not include other waste streams. Individual aerosol containers cannot exceed 1 liter in volume. Aerosols must be contained by strong outer packaging, such as a double-walled box. Max weight of a single filled box = 15 lbs. A “Limited quantity marking” sticker must be included on the exterior of the shipping box along with the shipping label. This label may be found in the "Resources" section on the program page or by clicking the buttons below. Cash donations are mailed directly to the charity in June and December. All cash donations requested between May 1st and October 31st will be disbursed in January. All cash donations requested between November 1st and April 30th will be disbursed in June. If I stop sending in shipments, will my account be deactivated?